“Ramapo College and its community have supported me tirelessly these past four years, pushing me to where I am today. I’ve had the opportunity to assume leadership positions in multiple organizations, collaborate with faculty and network with professionals. This past summer, I studied abroad in Greece where I learned about the role of the Mediterranean Diet throughout Greek history in terms of political, economic and social contexts. Beyond the classroom, I had a chance to embrace Greek culture on the streets of Athens and explore the beautiful islands of Agistri, Aegina and of course, Santorini. While I savored every moment abroad, I also used it as a vehicle to conduct research on the effects of the Greek bailout crisis on small businesses in the Pangrati neighborhood of Athens. Returning to Ramapo as a Global Roadrunner has allowed me to extend my experience by encouraging other students to study abroad and create memories of their own. As the countdown until graduation begins, I imagine that my career after Ramapo will be just as illuminating as my time at the college has been.” – Mehnaz Ladha ’18 graduated with a degree in Communication Arts with a concentration in Journalism and a minor in International Studies. 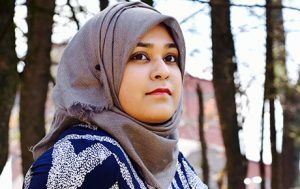 While at Ramapo, Mehnaz was named to the Dean’s List, is a Presidential Scholar in the College Honors Program and was a member of the Academic Honor Societies: Omnicron Delta Kappa, Sigma Iota Rho, Lambda Pi Eta, Golden Key Honor Society, & Alpha Lambda Delta. She was a recipient of both the Hiden Scholarship and Millicent Anisfield Scholarship. Mehnaz completed research for her College Honors Senior Project that was conducted in Athens, Greece during Summer 2017. Mehnaz was a very active on campus, she was a staff writer at the Ramapo News, a Global Roadrunner Ambassador, the President of Lambda Pi Eta and a former Secretary of Alpha Lambda Delta. She had a variety of internships: Editorial Intern at Wainscot Media (Aug. 2017-present); Editor & Writer at SunCity Paradise (July 2015-present); Webmaster for AndreaSmith.org (June 2016 – present); Publicity Consultant for Bergen County Horse Rescue (Jan.-May 2017); Communications Intern at the Borough of Franklin Lakes (May-August 2015).